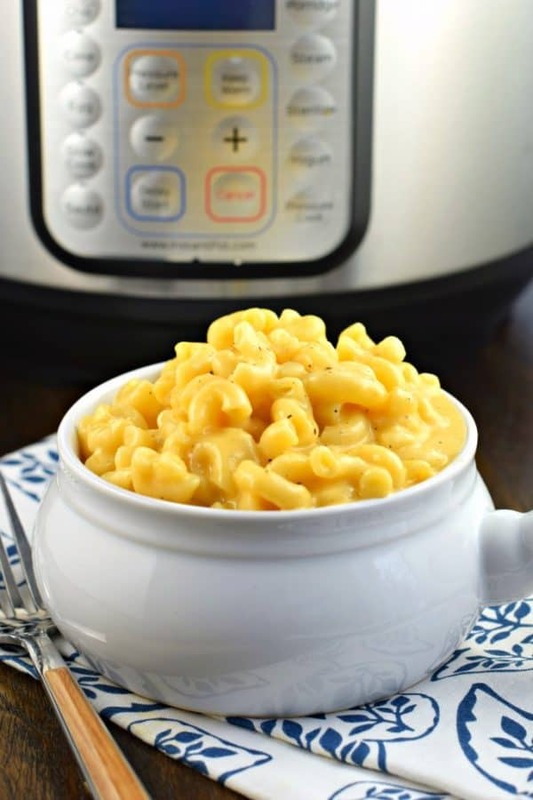 You’ve stumbled on THE BEST Instant Pot Mac and Cheese recipe! Super creamy and ready in ten minutes using your pressure cooker! It’s no secret my family LOVES macaroni and cheese. I mean, are there families who don’t? But seriously, if you poke around here you’ll find recipes that are made in the oven, like a classic style mac and cheese, or with bacon! And you’ll even find a stove top version that’s ready in minutes. Today, I created a Mac and Cheese for the Instant Pot! One that makes a super creamy pasta all cooked together in no time. Are you ready? Creamy, delicious, throw it all in and enjoy in minutes. 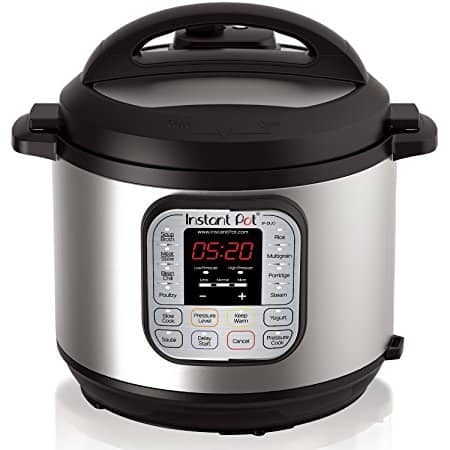 I use this 6qt Instant Pot for all my recipes. I do know this also works well in the 8qt (and can be doubled in the large one too). Add the uncooked macaroni pasta, water (and/or chicken broth), dry mustard, and salt and pepper to the Instant Pot. Close and lock lid and turn the valve on top to “sealing.” Press “manual” or “pressure cook” and adjust to high pressure. Set the time for 5 minutes. Allow to start. Once the time is up, use the quick release immediately. Open the instant pot away from your face (learned the hard way). Using a wooden spoon, stir the pasta to break it up a little bit. Add in milk, cheese, butter, and nutmeg. Stir until completely melted (takes about a minute). Season with more salt and pepper if needed. Serve and enjoy. You’ll need 4 cups of water for this recipe. I prefer to either use ALL chicken broth, or at least half chicken broth for best flavor! It really does make a difference. You could also use vegetable broth to keep it vegetarian. Don’t skimp on the salt and pepper. I give a general amount in the ingredient list, but add more if desired. It really brings out the flavor. Use good cheese. For the photos I used basic store brand cheddar cheese. But using a Cabot Cheddar would make this even more flavorful! Also, for the cheese, shred your own, don’t use the already packaged, shredded cheese. It doesn’t melt as smoothly as it would if you buy a block and shred it yourself. Trust me. For more depth of flavor, add a variety of cheese to the recipe. A combo of gouda and cheddar is delicious, or even mozzarella and cheddar is good too! Experiment! 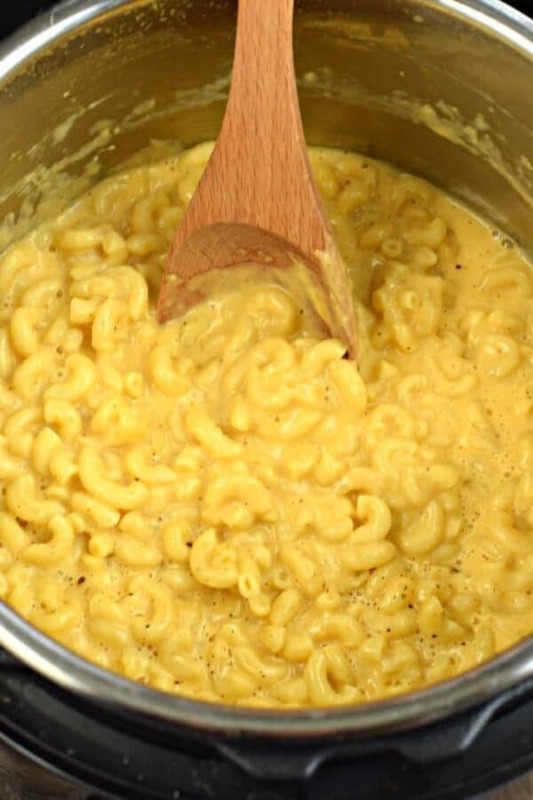 You’ll find a lot of recipes for Instant Pot Mac and Cheese call for both evaporated milk and parmesan cheese. Personally I’m not a fan of either in this recipe (I tried it, and prefer my own method). I find it is much creamier with real milk (I used whole milk) and the parmesan left a slightly grainy texture. I wasn’t a fan. Ritz Cracker Mac and Cheese is made with two kinds of cheese and is topped with buttery Ritz crackers for a creamy, rich side or main dish that the whole family will love. Nothing says comfort food like homemade Macaroni and Cheese! The gouda adds a creamy tang while the bacon adds a nice salty, smoked flavor! Try this at your next family dinner! Creamy white cheddar macaroni and cheese just like Panera. Give this copycat Panera Mac and Cheese recipe a try. Oh and it’s quick and easy on the stove top too!! While mac and cheese is a great side dish. 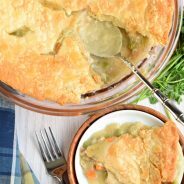 I’ve got a few other classic recipes that you may enjoy! No holiday is complete without them! This Cheesy Hashbrown Casserole recipe is true comfort food. Made with frozen hash browns and plenty of cheese, I can guarantee your family is going to enjoy this one! In my family, the Best Sweet Potato Casserole recipe is one that’s served up sweet and salty with a delicious, crunchy streusel topping! Oven Baked Mashed Potatoes are creamy, delicious, and easy to assemble ahead of time. But, don’t tell anyone, I’ve got the secret on how to make them with instant potatoes! As part of my ongoing Instant Pot series, you’ll find all my delicious recipes in my Instant Pot archives. Stay tuned because I’m constantly adding new ones! 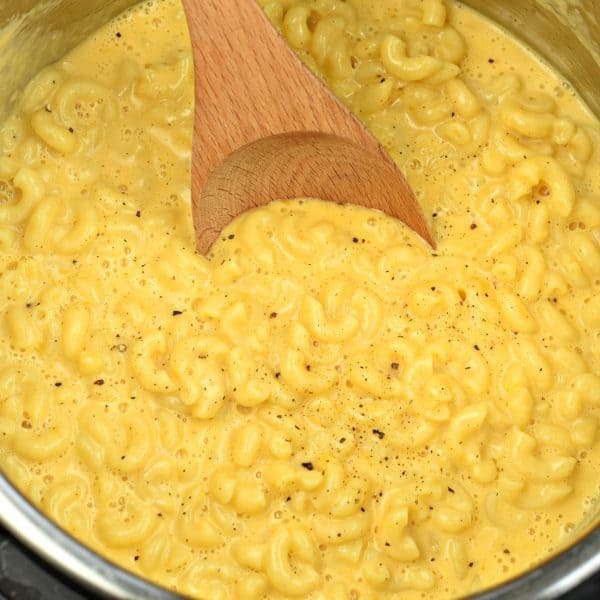 You've stumbled on THE BEST Instant Pot Mac and Cheese recipe! 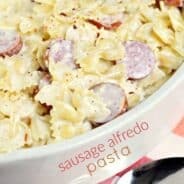 Super creamy and ready in ten minutes using your pressure cooker! Add the uncooked macaroni pasta, water, chicken broth, dry mustard, and salt and pepper to the Instant Pot. Close and lock lid and turn the valve on top to "sealing." Press "manual" or "pressure cook" and adjust to high pressure. Set the time for 5 minutes. Allow to start. My kids are going to be so excited! I am making this tomorrow! Great recipe! 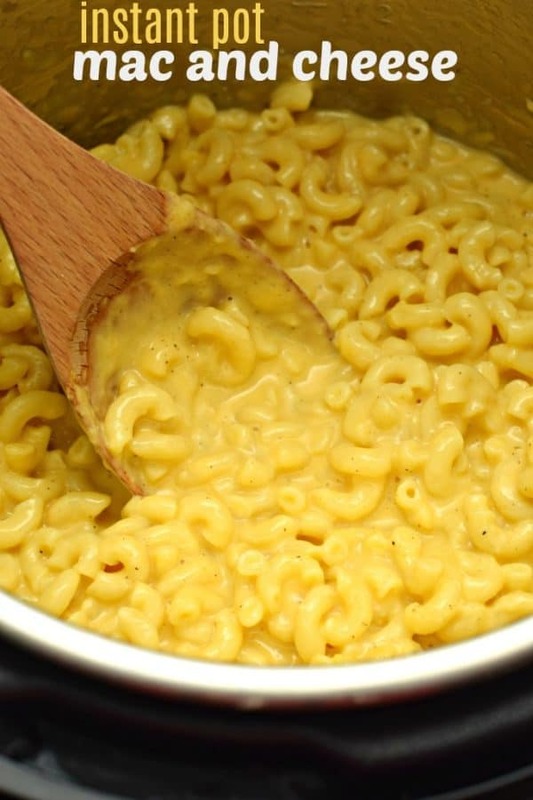 This is my favorite way to make Mac and cheese!! So stinking good. This is the best macaroni and cheese recipe for the instant pot I have ever found! I couldn’t believe how fast it was to make from start to finish and the kids loved it!!! This is perfectly creamy and cheesy! I love how quick and easy it comes together in the Instant Pot! 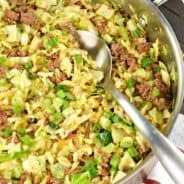 I always love your instant pot recipes – another keeper! 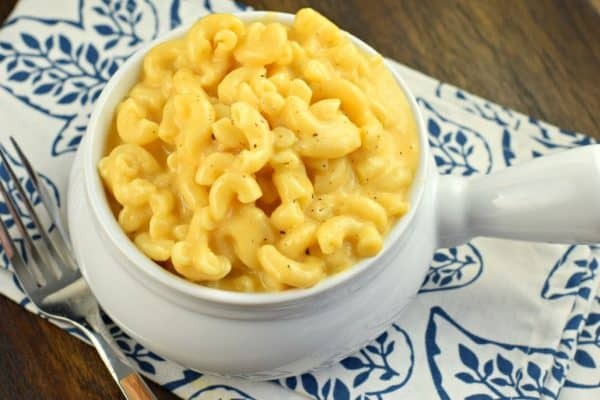 Mac and cheese in the instant pot is the greatest! Could this be made on the stove top? I don’t own an instant pot, pressure cooker, or crock pot….